Information for Marina Owners/Operators | Welcome to NJBoating.org! Contact the Marine Trades Association of New Jersey (MTA/NJ) at 732-292-1051 or by fax at 732-292-1041 to request an application. Return the completed application to the MTA/NJ at 2516 Highway 35, 2nd Floor, Manasquan, NJ 08736. After the MTA/NJ reviews the application to verify it has been has been executed correctly and meets all federal Clean Vessel Act requirements, it will be forwarded to the New Jersey Division of Fish & Wildlife for approval. After the Division of Fish & Wildlife approves the application, the marina will be instructed in writing that it is eligible to participate in the NJCVA Program and to purchase and install a pumpout unit. The marina is then free to choose from various manufactured pumpouts available on the market. The marina is initially obligated to purchase and install the pumpout unit at its own expense. After the pumpout unit has been installed, the Division of Fish and Wildlife will inspect and approve the pumpout. Once approved, the marina will be reimbursed 100% for its purchase and installation of the pumpout. This reimbursement comes from both federal and state funds. 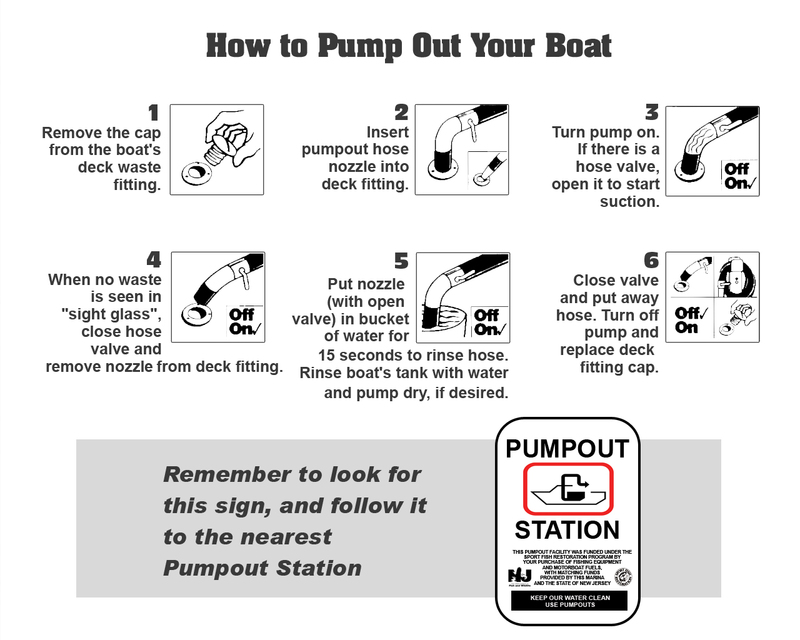 Once the installed pumpout is approved, the marina may charge no more than $5.00 per boat for pumpout service. For further information on the application process, contact Marine Trades Association of New Jersey at 732-292-1051. If you would like to obtain educational materials, contact New Jersey Fish & Wildlife at 908-637-4125 ext. 116.